Firearms, like other tools, fulfill a specific application for the user. If you wanted to nail deck boards down, you’d pull out your nail gun. If you are looking to go hunting, target shooting or home defense, you would choose an AR-15. The AR-15 serves many purposes, it is extremely customizable and can be a showpiece of individuality along with being a hard-working firearm. Every collector needs a signature AR-15 set up to their specifications, and anyone looking for a versatile firearm should consider a Stag Arms rifle. The first thing to determine when choosing a rifle is to ask yourself, “For what purpose am I purchasing this rifle?” Once you answer that question, it makes it a lot easier to narrow your search to a specific model. Target shooting. One of the most popular uses of our rifles is target shooting, and it is where most of our customers start their journey as shooters. You can challenge yourself or your friends’ by shooting at targets to see who gets the highest score, or you can simply practice shooting for self-improvement. A day at the range can also create a family or friends bonding experience. Hunting. Stag 15 rifles are able to be used to hunt a wide range of animals. The 5.56 models are great for varmint and small game hunting, with the Stag 15 Varminter being specially designed for that purpose. Our Stag 15 Super Varminter rifle was designed to hunt larger game such as deer and it utilizes the 6.8 SPC II cartridge for more power. Home defense. The AR-15 is a good choice for home protection. The 5.56 cartridge is a great choice to stop an intruder intent on doing you harm and has less penetration through walls and structures than pistol rounds shot through a carbine or buckshot out of a shotgun. Competition. Many of our rifles are used in competition such as the Stag 15 Retro in the service rifle category, the Stag 15 Varminter with a ½ MOA, and the Stag 15 3Gun Elite which was designed from the ground up by our shooting team for 3-gun competitions. You need to make sure the company is reputable in the industry. It’s best to ask knowledgeable people, and use an internet search engine to look up information about the company and what others have to say about them, especially if they have had repeated issues. Every company from time to time will have an issue with their manufacturing, so you should also look up how a company acts and works with the customers when these issues do arise. You should also make sure the firearm you’re planning to purchase has a warranty or guarantee. All Stag Arms rifles which ship from our factory include an industry leading lifetime transferable warranty and an infinite shot guarantee with the barrel. Magazine Size: What is Legal? Some states have restrictions on magazine size which you should know before trying to purchase additional magazines for your rifle.You need to check your state law to confirm what size magazine is legal. You can check this chart to see what is legal in your state. Determine your purpose for purchasing the rifle. 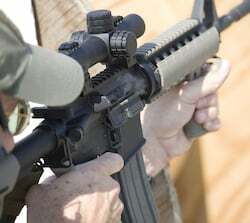 Some common purposes for purchasing an AR-15 include target shooting, hunting, home defense, and competition. See if the company has a satisfying reputation. Look for a great warranty or guarantee to save you from encountering issues in the future. Check your state law to confirm what size magazine is legal.